So what can you do about back pain and neck pain? Firstly, remove the possibility that the cause of pain is from sitting incorrectly i.e. poor posture. 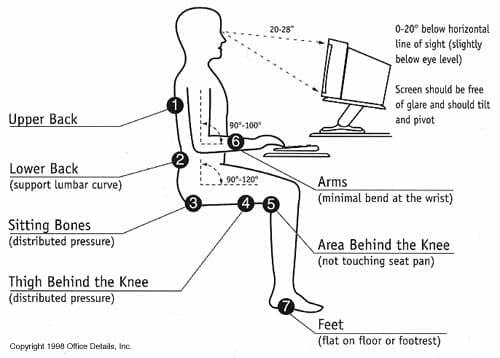 Check that you have the best ergonomics for your work desk and computer. Here is a quick guide. Sometimes the easiest and quickest results come from releasing and lengthening tight muscles. Generally, these are your anterior chain muscles. This includes your quads, hip flexors, lower back, chest and upper neck. Here are some office based mobility and stretching exercises that you can do in your chair. The core muscles deserve a category of their own. They play such an important role in correcting and maintaining good posture and fighting excessive flexion. Generally referred to as our stabilising muscles, their primary role is to ensure spinal stability. Our core muscles comprise of up to 35 different muscle groups and strengthening them is not as simple as just doing sit ups. The firing sequence, muscles length tension and correct activation are all critical to ensuring optimal function to help reduce back pain and neck pain. Some exercises suitable for this area are core strength classes or Pilates inspired exercises . These focus on your lower abnormal and transverse abdominal muscles. These core exercises should also include correct breathing techniques With an estimated 80% of people having a breathing dysfunction, breathing exercises strengthen the upper core muscle of the diaphragm. Who would have thought that sitting could be that dangerous? The problem is not the sitting but the amount of time we sit, which creates these chronic dysfunctions, leading to lower back pain, neck pain, headache and migraines. You now have some information to do something about it, so that you do not suffer these chronic pains. Prevention is always better than the pain and the corrective exercise cure!! Advice from a qualified health care professional in this area is always recommended in determining individual pain and dysfunctions. If you would like to investigate this further, we are happy to help; just call or contact us.